Fewer than a dozen members of the English Defence League turned out in Wellington for the group's first national rally of the year. 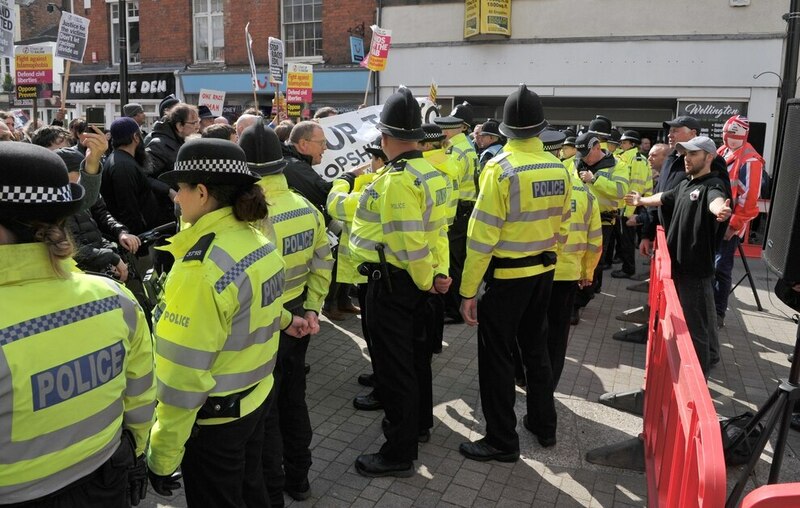 They gathered in Wellington Square, surrounded by dozens of police officers and met by about 100 anti-racist counter protesters. 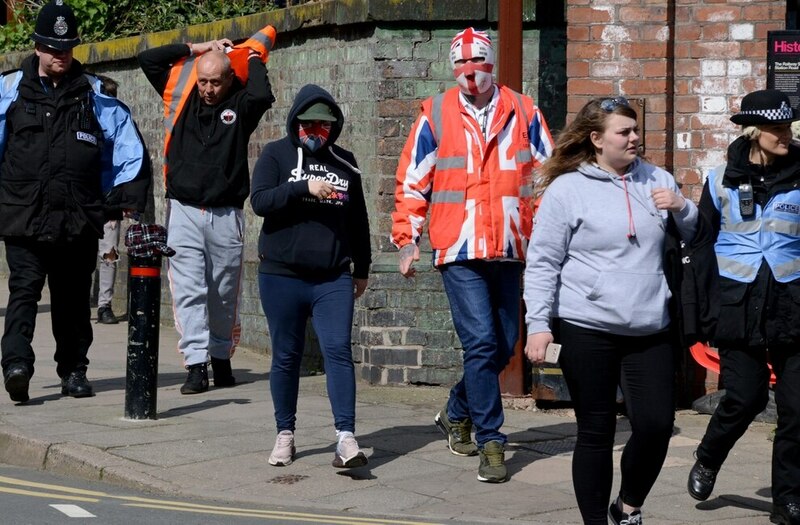 The far right group had been set to march along Church Street, round Market Street, Bridge Road, Queen Street and back onto Church Street. But instead the small group were led straight to their designated area of Wellington Square for about an hour of speeches. They began at about 2pm and both groups had disbanded by 3.30pm. 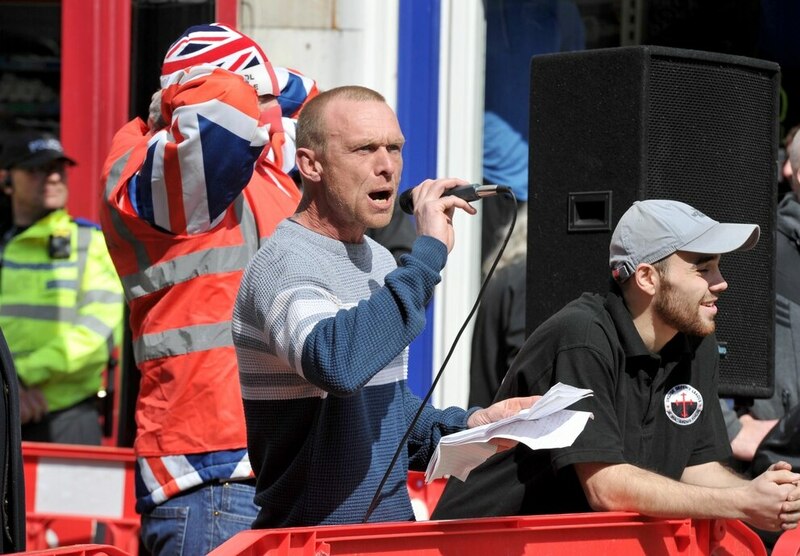 The EDL had about four speakers, each met with jeers and boos from counter protesters. They appeared in Wellington after national reports about child sexual exploitation in Telford last year. A line of police officers stood between the groups, separating them and moving anybody along who looked like they might be trying to get to close to the other side. But the sturdy line of officers didn't prevent the two groups from shouting threats and insults at one another. 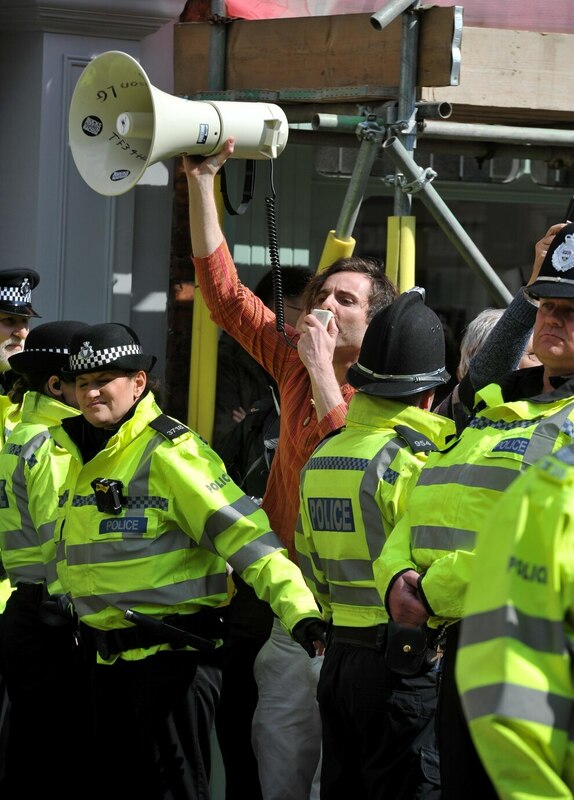 As well as preventing issues between the two groups, police also helped to guide shoppers around the protest. Superintendent Paul Moxley thanked members of the public for their patience during the pre-planned protests. "I’d like to personally thank people in Wellington this afternoon for their understanding and co-operation while a pre-planned protest took place," he said. "We and the local authority understand the impact this event will have had on businesses. 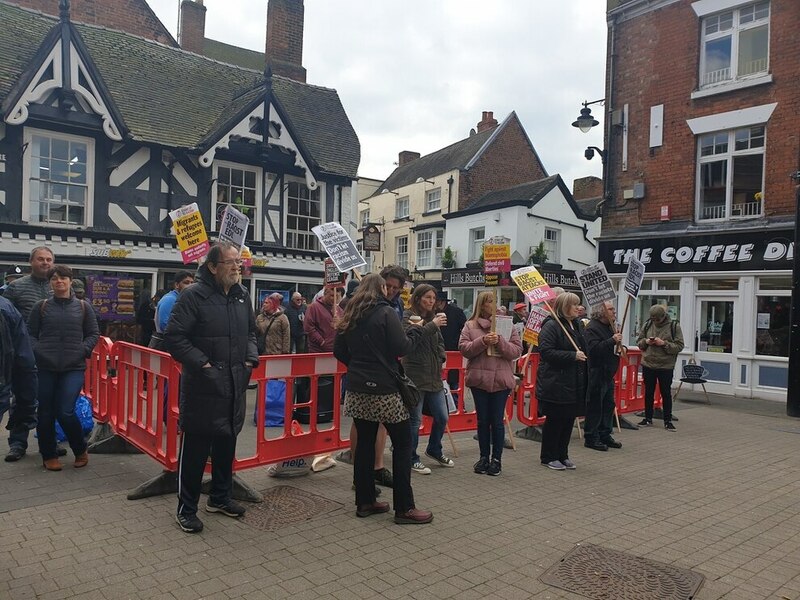 "A small number of people took part in the protest, with a small number also taking part in a counter-protest with both passing smoothly without any cause for concern. 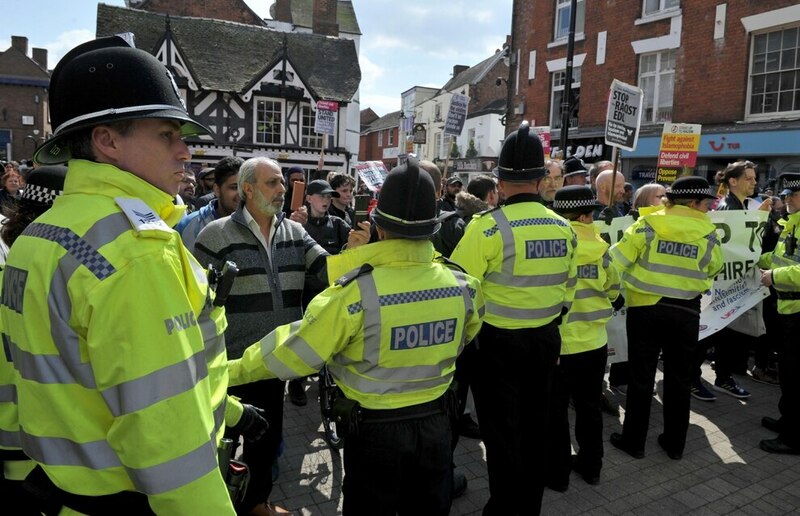 Ian Robbs, 76, travelled from Shrewsbury to protest the EDL's rally. "I am against racism," he said. 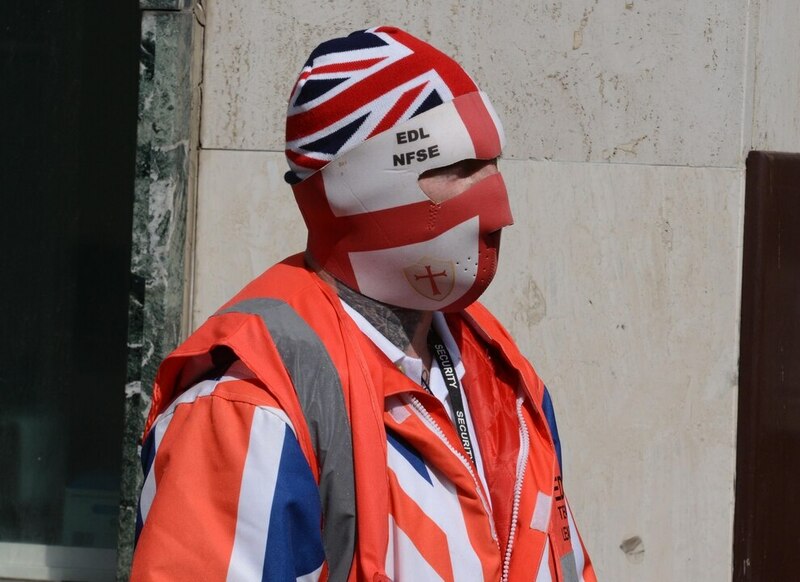 "I wanted to show the community of Wellington that not everybody supports the EDL. This is a multi-national community, that wants to live in peace, all peoples and cultures together. "A lot of the public aren't aware of the public far right people spread in our society. It's a nasty poison that tries to divide people against each other, and we mustn't let it happen." 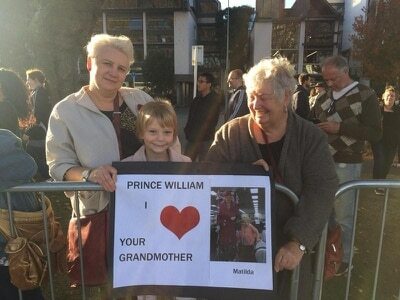 Melanie Wilder, 61, from Shawbirch, said: "I'm here because sexual abuse isn't a race issue, it is a gender issue. "Sexual abuse occurs across every community. We're a multicultural society, we should embrace people from all societies and cultures, but we should all be coming together against all forms of abuse." 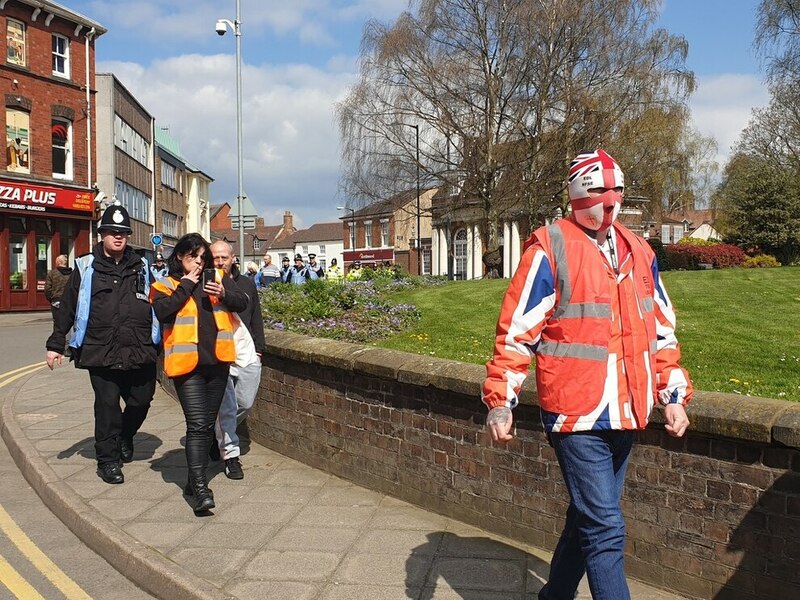 The group last marched through Wellington in May last year, in the wake of national reports about CSE in Telford. 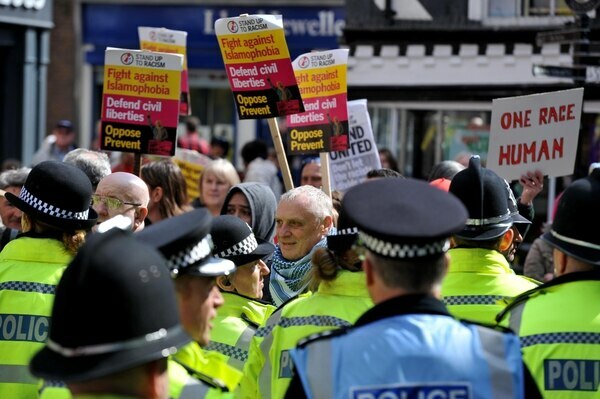 About 50 EDL marchers and 40 counter-protesters turned out on that occasion. 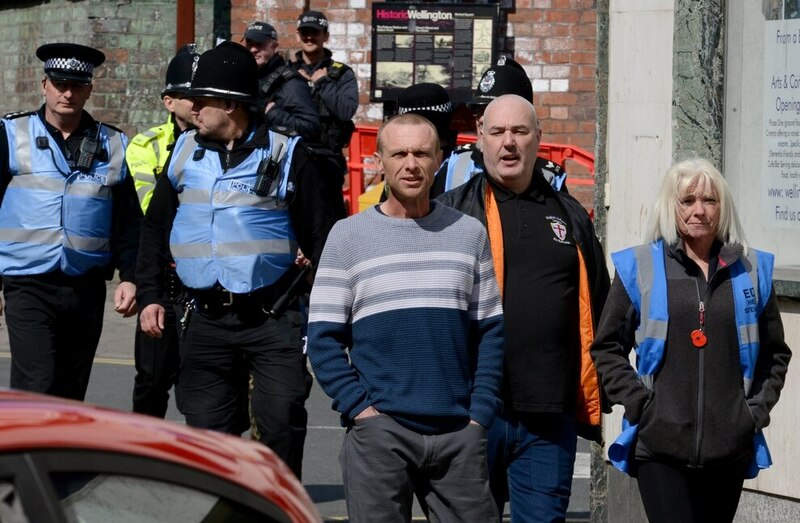 The EDL are starting to walk away. Police line the route they'll be walking along. Looks like things are wrapping up. Organiser to the crowds: "How can you call us nazis? 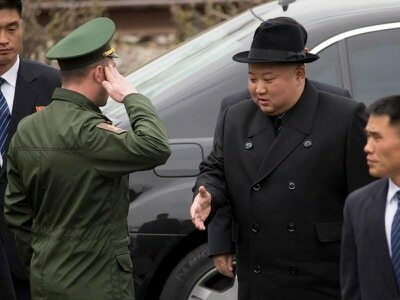 I wasnt born in World War II." 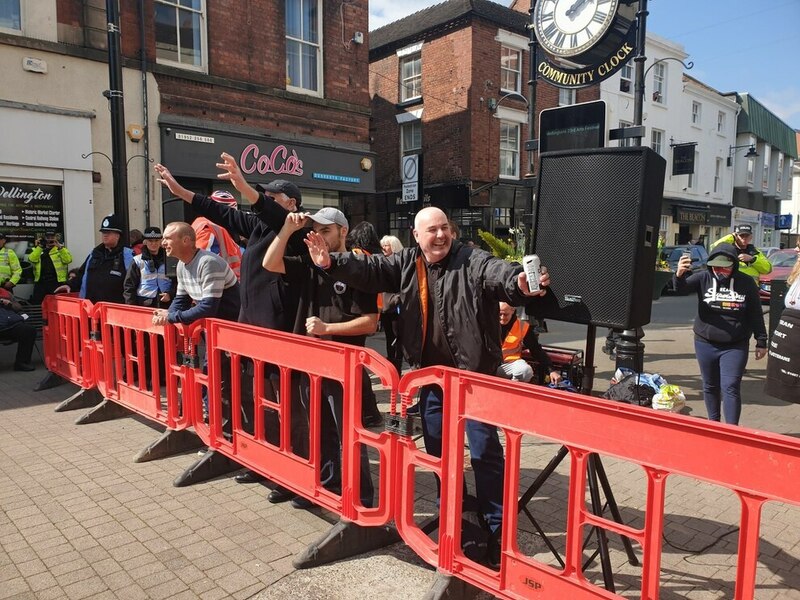 One guy from the EDL side, stood behind a thick police line, shouting "You wont even come over here." 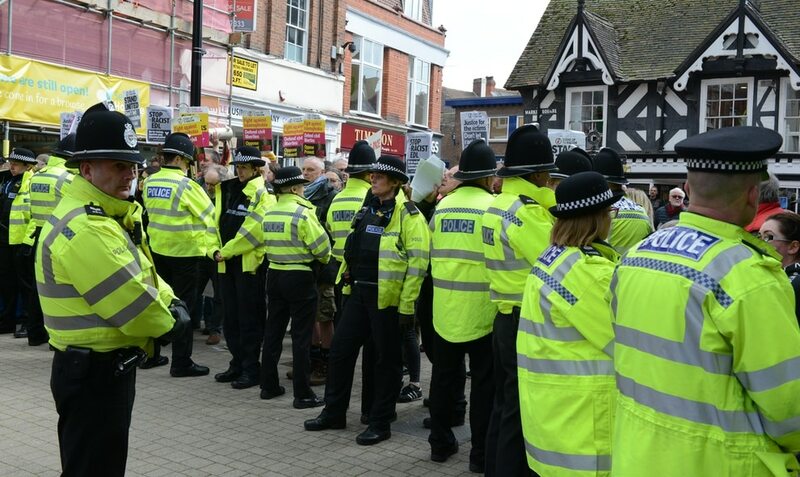 West Mercia Police had precautionary plans in place to keep any disruption to a minimum. British Transport Police were also involved. You may see extra officers on patrol in #Wellington today to minimise disruption ahead of events planned in the town this afternoon. Do stop and speak to us if you have any concerns. The protests in Wellington are now over, so we would ask the groups to please leave the area to help us return to business as usual. Thank-you to everyone affected, we appreciate your support.